Denotes a set for as many reps as possible on the last set. For example if a workout has Squat+ and 4 sets of 5, that means that on the first 3 sets you will do 5 reps but on your last set you will do as many reps as you can with good form. This refers to how close to failure a set should be taken. A failure set would have an RIR of 0. A set that is stopped 1 rep short of failure would be an RIR of 1. A set that is stopped 2 reps short of failure would be an RIR of 2, and so on. In general we recommend 3-6 warm up sets for main lifts in a progressive fashion. For a reasonable warm up template you can follow what we demonstrate for the 1 rep max warm up. We do not provide cardio recommendations as that would depend upon your individual fat loss goals. For those interested in gaining as much muscle and strength as possible, in general, we recommend as little cardio as possible as cardio will have a negative interference with strength and hypertrophy adaptations. Rest times between sets do not seem to impact hypertrophy or strength so long as these other factors are met. In fact, there is data suggesting that strength and performance are impaired if not enough rest is taken between sets. As such, we recommend resting as long as is required to feel physically and mentally fresh for the following set and ready to give it your complete 100% focus. If time constraints are an issue then you can take shorter rests with the understanding that performance may suffer to a certain extent. Sometimes an “X” will be used in place of a number such as “30X1”. The X denotes explosive movement being used in that phase. In this example you would move the weight as fast as possible during the concentric phase of the lift. Remember that some exercises start with the eccentric portion first (Back Squats, Bench Press) while others begin with the concentric portion first (Deadlifts, Hip Thrusts). However, the tempo will always be listed in the order listed above which starts with the eccentric. Therefore, for exercises which begin with the concentric, you must start reading the tempo beginning with the third digit (which represents the concentric). For example, deadlifts with a “4211” tempo does not mean 4 seconds concentric, 2 second pause, 1 second eccentric, and 1 second pause. Instead you start with digit three and read it as 1 second concentric, 1 second pause, 4 second eccentric, and 2 second pause before the next rep. Blood Flow Restriction seems to be very safe based on current data however we only recommend advanced trainers who have been properly instructed in BFR utilize it in their training. Please be sure a qualified personal trainer has instructed you and you have been cleared by a physician to engage in vigorous weight training. 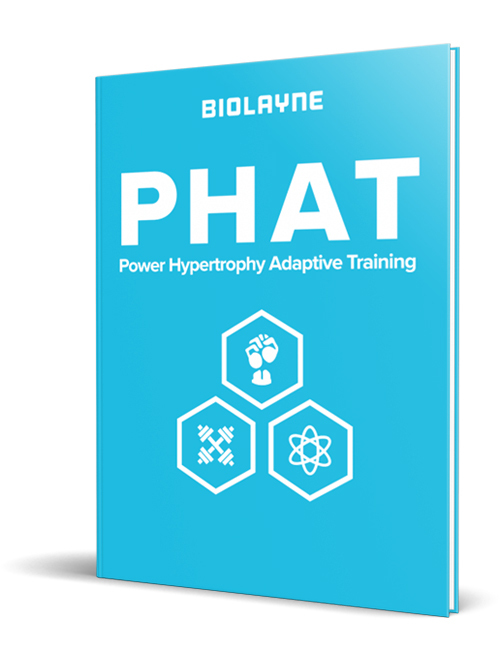 BioLayne LLC assumes no liability for individuals who choose to engage in this exercise without proper instruction. Simple foundational movements. Perfect for beginners who have less than 1 year of formal resistance training experience. Requires refined movement technique and work capacity. Great for those with 1-2 years of formal resistance training experience. Involves more volume/intensity and advanced training modalities. Must have well established movement technique and body awareness. 2+ years of formal training recommended. Targeted toward more advanced trainees. Must have well established movement technique and body awareness. 3+ years of formal training recommended. Highly intense and taxing on the body. Requires ideal conditions in terms of rest, recovery, nutrition, and lifestyle. Recommended 3+ years of formal training with vast experience in movements being used.